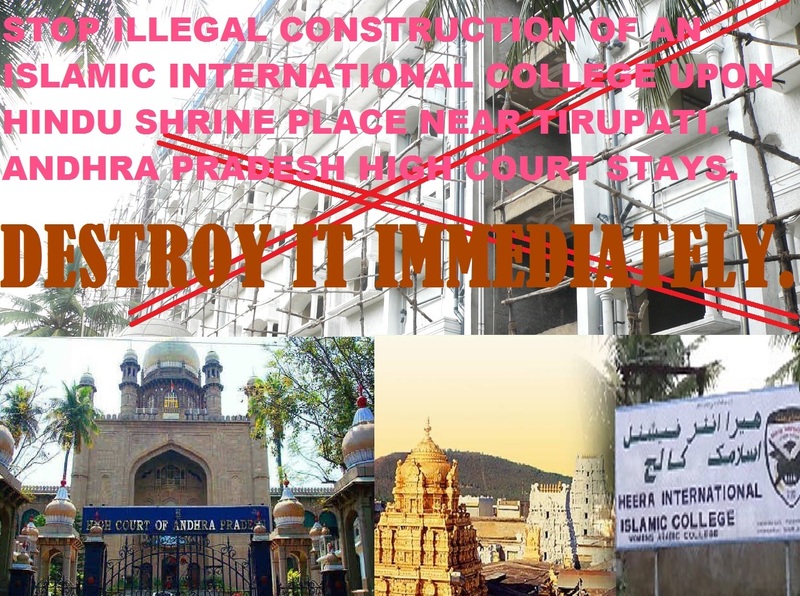 AP High Court stays on the illegal construction of International Islamic College near Tirupati. Stop work in arabic school: High Court. Hyderabad | The Asian Age | Dec 5, 2013:: The AP High Court on Wednesday directed authorities not to allow any construction on the premises of the Islamic Arabic School, Tondawada village, near Tirupati. Justice Nooty Ramamohana Rao was dealing with petitions by the Madrasa-e-NiswanIsha-Atul Islam Urdu and Arabic Development Society represented by its president Shaik Nowheera, the Tirumala Tirupati Samrakshna Samiti (TTSS), and S. Muni Gangi Reddy, former sarpanch of Chandragiri. The management of the school had moved two petitions, one contending that the Tondawada gram panchayat was threatening to demolish the building. In their first petition, the management of the Islamic Arabic School, Tondawada village, near Tirupati, explained why they had constructed extra floors and were ready to pay the required amount to regularise the floors. The second writ petition moved by the school management challenged the orders of the district collector directing the local panchayat, with the help of the police, to demolish the portions of the structure which had come up in violation of the sanctioned plan. The judge, however, asked the society to explain how six floors were built when permission was given for ground and first floor. Expressing concern about the stability of the structure as it was built on land adjacent to a water body, the judge directed that no workers should enter the premises and it was not to be used. The Tirupati Urban Development Authority has to approach the civil engineering department of SV University to asses the stability of the structure. Dear Hindu Friends and devotees of Lord Venkateshwara Balaji, Tirupati. Lord Venkateshwara Blessed on joint Efforts of Hindus & gave immense strength to Fight against Illegal Islamic University at Tirupati. Now, the AP High Court stays upon the illegal construction forthwith. The AP Govt earlier issued orders to Demolish illegal 5 floors of University. But, we want to raise this issue more strict and get Complete Demolition of this illegal structure. 2. There is special law in Tirupati preventing any other religion to propagate. In this month, we have Planned Huge Hindu protest in TUDA Ground, Tirupati on 20th December 2013 at 10.30 AM to 2 PM against the illegal establishment of Islamic University near Tirupathi Devasthanam. More than 10,000 Lord Balaji Devotees, Respected Swamijis and eminent Hindu personalities of Andhra Pradesh and other places will attend this congregation to protest Islamic University near Tirupati Balaji Temple. Join us ….Donate us …And get Blessings of Lord Tirupati Balaji. The illegal construction must be razed to the ground. These khangress sickular agents will make mini Porkistan in every state of India. Wake up dear Indians, don’t allow Jihadi fundamentalist to get their plan of Islamisation India a success. Get set & be alert before its 2 late. Look at Kashmir and see what this Abdullah Dynasty has done to the Hindu Pandits in the name of Ethnic Cleanzing. Do u want to live as Dhimmis in your own land ….CONGRESS MUKT BHARAT is the only solution. This entry was posted on December 6, 2013 by hinduexistence in Attack upon Hindu Temple by Muslims, Congress against Hindu Leaders, Conspiracy against Hindus, Hindu Protest, Hindu Tradition and Culture under attack, Hindus under Attack, Hindus under Islamic Aggression, Hindusthan under Islamic Attack, India under Islamic Aggression, Indian Judiciary, Islamic Menace, Religious Rights of Hindus, Save Bharat (India) from Jihad, Save Hindu Dharma, Save Hindu Temple Property, Save Hinduism, Save India from Supremacist Islamic Conspiracy, Stop Islamic Menace in India, STOP MOSQUES IN HINDU AREAS, STOP MOSQUES NEAR HINDU TEMPLE, Violation of Hindu Religious Rights, Violation of Hindu Rights and tagged Andhra Pradesh High Court, Heera Arabic School (Islamic University), International Islamic College near Tirupati, Shaik Nowheera, Stay on Islamic Arabic School- Tondawada village- near Tirupati., Stop work in illegal Arabic school: AP High Court, the Tirumala Tirupati Samrakshna Samiti (TTSS).